All transactions are safe and secure with a reliable history in online purchasing behind each of our associates. 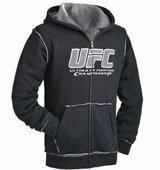 Buy the UFC Logo Sweatshirts and Hoodies to own UFC clothing and merchandise. The UFC sweatshirt hoodie on the left features a raised grey and white UFC logo stitched on the front, along with a grey cotton-Sherpa lining and stylish contrast stitch piping. The comfortable black hooded sweatshirt is perfect to warm up in before a workout, or to lie around the house in on a chilly afternoon. Add this hoodie to your collection of MMA and UFC apparel. Wear it with MMA fight shorts. In addition to the UFC Logo Sweatshirts and Hoodies above, browse the UFC Clothing Gallery for more apparel like men's and women's clothes, kids shirts or hoodies.